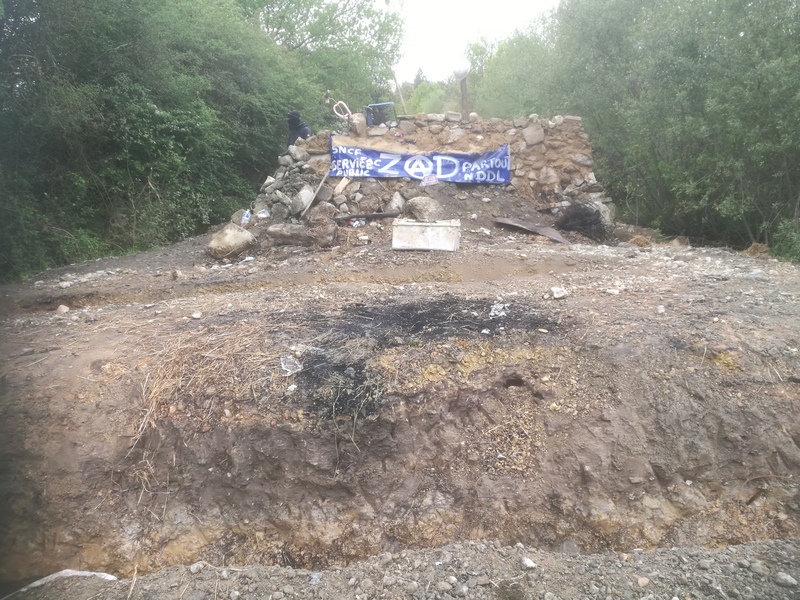 You are not unaware that this road crosses a territory included in la ZAD and that it, since April 9 is the subject of a military intervention aimed at the eviction of its squats and their projects. We, the inhabitants of the extreme west, have therefore been forced to reflect on our positioning within this context. This, according to 4 different and complementary prisms, from the most “obvious” one to the one that can seem the broadest or most abstract for some, but that does not mean it is less important and real in our minds and for many others who are supporter or in LaZad. (1) the defense and security for the individuals from the neighborhood. (2) participation in the defense of or the expression of support for the squats in la ZAD, and all others implicitly threatened or directly attacked by “the police”. (3) the image that we wish to transmit, through the radiation (political, ideological, social …) enjoyed trough la ZAD in Nddl by the external sympathizers and all those who, in one way or another, have their attention focused on the events unfolding here. Taking these elements into account, setting up barricades to block a road is, in our opinion, very meaningful and has total sense : an effective action (the zadhabitants feel less exposed, vulnerable, the cops are disturbed in their operations etc.) and a symbolic meaning (insubordination, insurrection, revolt!). But there is another point that we have to deal with : it is true, despite this tension, this climate of conflict, this sword of Democles over our heads that threatens our physical persons, all our material goods, our friends, our utopia… despite all of this, life goes on. Life, the daily life, practical-praxis, with its many imperatives, truckdrivers, employees, customers, farmers, they make their rights heard… and that’s normal, we recognize it! It is with this in mind that we wanted to establish an open and respectful dialogue with the users most concerned by this issue ofthe road, by blocking / opening of this real conflict. Through this process, we have repeatedly found reasonable compromises. To date, in an agreement that satisfies the various interests, we opted for the opening of barricades to set them in chicanes from 7am to 9pm. This agreement, however, given the instability of the situation, is still subject to change. Every day, we strive to come together to question or validate its relevance. Relevance studied less in relation to state declarations than to the actions of his cops in the field, evictions or other “law enforcement operations”. We’ll keep you posted ! Hoping that our arguments help you to see more clearly, to better understand us …?